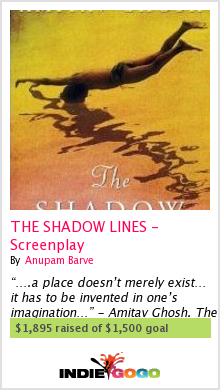 Anupam Barvé, who recently acquired the film option for The Shadow Lines (see my post of Oct 15) wrote to me today to say that he and his collaborator, Vaibhav Abnave, are trying to fund the project through an innovative new method, one that relies, as it were, on the film-viewing ‘commons’. What is more, they have already had considerable success – novel indeed are the possibilities opened up by the Internet! I am amazed to think of the possibilities this might open up. It could revolutionize film-making, setting it free of the studios. Will it be ok if I write a little article on this endevour– the signing of the contract and Anupam’s efforts to garner funds from ‘commons’– for the news agency Indo-Asian News Service (IANS)? And I shall also need your permission for using excerpts from your blog, and the communication between you and anupam as posted on the blog. will do that, of course. thanks! It’s a great idea and something similar has been tried here in Wales. The independent film, Resistance, based on poet Owen Sheer’s novel about a world in which the Nazi armies successfully invaded the Uk and came to a remote valley here, has been partially funded by lots of small local investors. I don’t know the details but I know their reward was to be invited to act as extras in a big set-piece sequence of the film, which is to be shown here at the end of the month. ‘The Shadow Lines’ story appeared today at several web portals and newspapers. Here is the link to one of them.